This card was made for Simon Says Stamps’ Flickr challenge #15. The theme for this challenge was to create a project that symbolized spring. Spring for me is difficult to pinpoint in Chicago. The season usually starts with slight, very slight, hints of days of sunshine and warmer temperatures. Then for some reason, just as the last bits of winter snow have melted, we get another dusting of snow which usually last for a few days and then disappears as temperatures start to warm up again. Early spring is such a tease in Chicago. It never makes you feel fully assured that it is on its way and wants to stay. So to bring a little spring that lasts, you have to be content with making cards that are bright, sunny and warm your imagination of more pleasant days ahead. I made this card by creating a soft blended background of water color washes in yellows, spring sky blues and greens on watercolor cardstock. I then used a stamp set from Simon Says Stamp called Summer Garden and stamped the largest flower and a few leaves from the set. 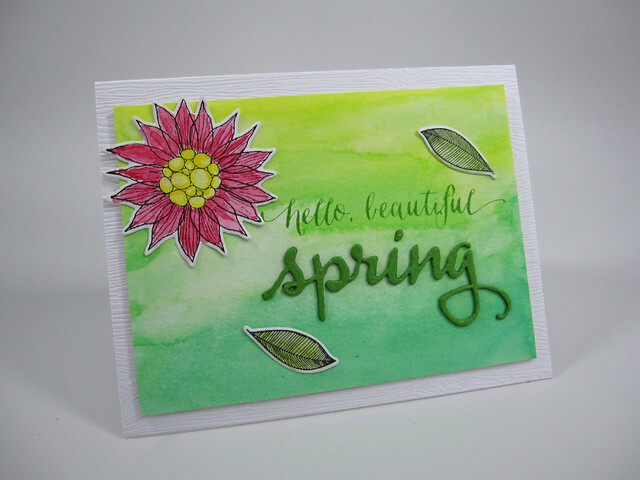 The images were stamped on watercolor cardstock using Versafine Onyx Black ink and then colored using watercolor shades that remind me of what spring should be. The flowers and leaves were die cut using the coordinating dies for the stamp set. The sentiment “hello, beautiful” was also part of the set. That was stamped in a green ink. I added the die cut word “spring” from Winnie & Walter for emphasis and covered the word with shimmer using Wink of Stella clear glitter pen. Everything was then mounted as you see and matted against a 4.25”x5.5” piece of wood grained-cardstock and then mounted on an A2 horizontal top-folding card base. Hope Spring likes this card so much that it decides to stay. Dies: Simon Says Stamp: Summer Garden craft dies; Winnie & Walter: The Big, the Bold and Seasons Cutaways (dies). Cardstock: Papertrey Ink: New Leaf 110 lb. (for die-cut “spring”); water color card stock; Neenah Solar White 110 lb (card base); Essentials by Ellen wood grain cardstock. Other: Wink of Stellar clear glitter pen. This entry was posted in Seasons and tagged Papertrey Ink, Simon Says Stamp, Winnie & Walter. Bookmark the permalink.